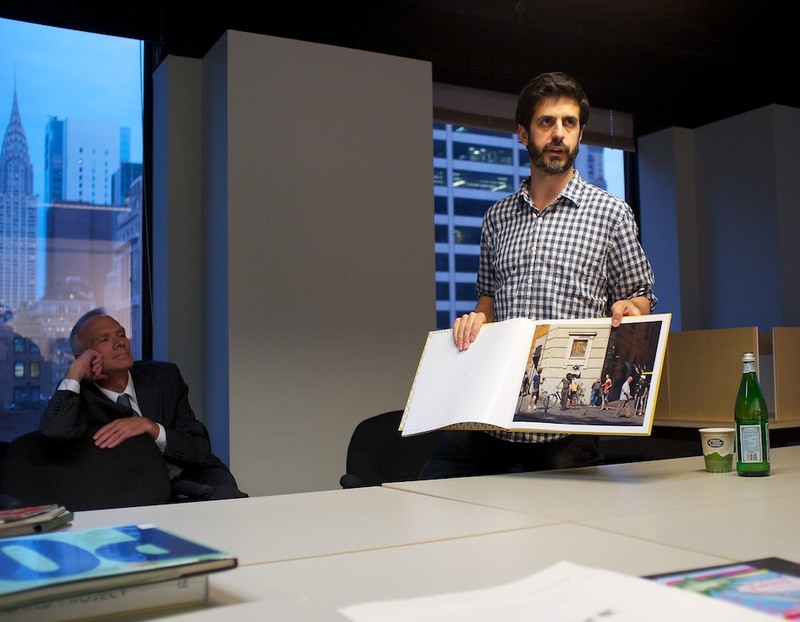 This past Monday evening the ICP Library Committee hosted the publisher of Little Brown Mushroom, Alec Soth, for an intimate seminar. Library Committee Co-chairs Stephanie Shuman and Evan Mirapaul assembled the line up, Phil Block led the discussion and Jeff Gutterman snapped the pictures. 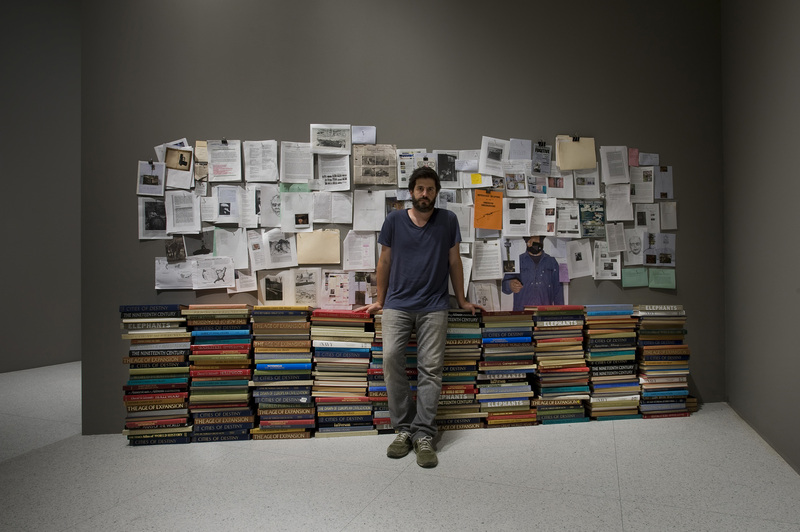 Alec Soth was poised and eloquent throughout as he spoke about his artistic practice and the books that have had a meaningful influence upon his life and work. Alec talked about his multiple and varied experiences in the world of photography: As a photojournalist on assignment with Magnum, as a teacher and as an artist, as a maker of fine art books and as an independent publisher. Alec Soth & LBM have produced some of the most unique and innovative contemporary artists’ books of our age and continue to push boundaries and question the very nature and form of the book. For this evening, each of his projects was brought to life through examples of his work and also some of the influential printed matter that sparked the original ideas. Alec emphasized the importance of his collaborations with other artists, designers and even members of his own family. But what was really important to Alec it seems was the importance of the ‘experience’ of a project – enjoying it, learning from it and living it. It was great to see a copy of the magnificent Broken Manual and also the amazing American Postcards project (the Magnum Road Trip). Alec had just come down from Rochester, NY where he has been again working with the collective of Magnum blokes and blokesses on the “House of Photos” expedition. This is a project to document and to create an archive of Rochester at this moment in time. I cannot wait to see the results of this extraordinary photo experiment. Alec is a truly charming and inquisitive photobook entrepreneur. Vantage points : campus as place / photographs by Beth Dow, Chris Faust, and Alec Soth ; [essays by Laurel Bradley and Frank Martin]. Exhibition held at the Carleton College Art Gallery, February 15 – March 10, 2002. Northfield, Minn. : Carleton College Art Gallery, 2002. Sleeping by the Mississippi / Alec Soth ; essays by Patricia Hampl and Anne Wilkes Tucker. The factory / edited by Ian Jack. (Chapter – The making of parts by Alec Soth). Niagara / Alec Soth ; essays by Philip Brookman and Richard Ford. Fashion magazine : Paris-Minnesota / by Alec Soth. Paris, France : Magnum Photos, 2007. Dog days Bogotá / Alec Soth. Göttingen : Steidl / Edition7L, 2007. Sheep / Alec Soth ; [design and layout by Paul Schiek ; editing and sequence by Alec Soth]. Oakland, CA : TBW Books, 2008. One Mississippi / Alec Soth. Portland, Or. : Nazraeli Press, 2010. Volume no.63 of the series: Nazraeli Press one picture book. Edition of 500. One day – ten photographers / edited by Harvey Benge. From here to there : Alec Soth’s America, Walker Art Center, Minneapolis / edited by Siri Engberg ; with texts by Geoff Dyer … [et al.]. Minneapolis, Minn. : Walker Art Center, 2010. Brighton picture hunt / by Carmen and Alec Soth. “From a Photoworks commission published to coincide with the first exhibition of Brighton Picture Hunt at Brighton Museum & Art Gallery, 2nd October – 14th November 2010, as part of BPB 2010: New Documents, curated by Martin Parr.” — Colophon. 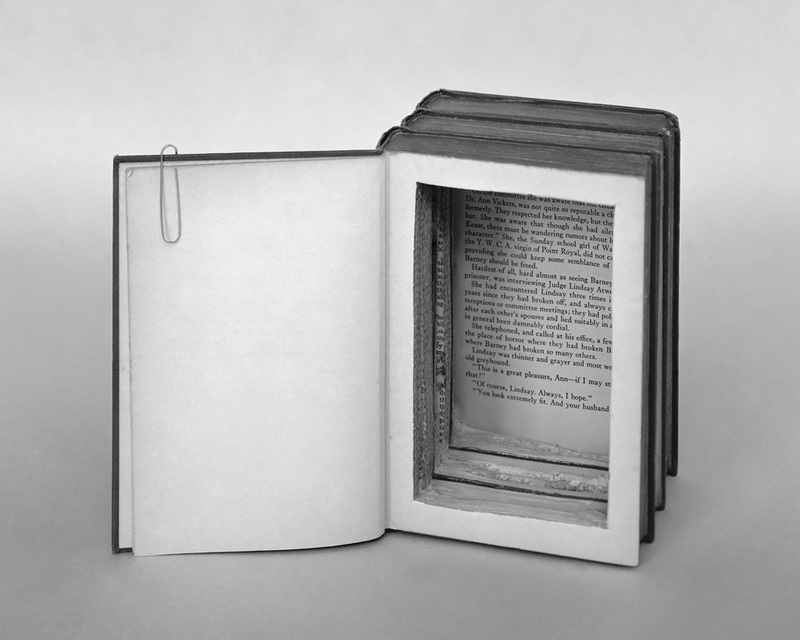 Broken manual / Lester B. Morrison & Alec Soth. [Saint Paul, Minn.] : Little Brown Mushroom ; Göttingen, Germany : Steidl, 2010. Ash Wednesday, New Orleans / Alec Soth. Kanagawa, Japan : Super Labo, 2010. The Auckland project / John Gossage and Alec Soth. Santa Fe : Radius Books, 2011. Rodarte : Catherine Opie, Alec Soth / [by Kate Mulleavy … Ed. by Brian Philipps]. Zurich : JRP Ringier, 2011. Mostly women / Alec Soth. Portland, Oregon : Nazraeli, 2011. Edition of 150. Nazraeli Press Six by Six series , Set 2 volume 5. La belle dame sans merci / Alec Soth, cura di Marco Delogu ; [testo: Francesco Zanot]. Postcards from America : San Antonio TX, Del Rio TX, Highway 90, El Paso TX, Bisbee AZ, Las Vegas NV, Fresno CA, Oakland CA / Alec Soth, Jim Goldberg, Susan Meiselas, Paolo Pellegrin, Mikael Subotzky, Mikhael Subotzky & Ginger Strand. New York, N.Y. : Magnum Photos, 2012. The last days of W. / Alec Soth. Saint Paul, Minn. : Little Brown Mushroom, 2008. Lost Boy Mountain / Lester B. Morrison]. Saint Paul, Minn. : Little Brown Mushroom, 2010. The Brighton Bunny Boy / by Carmen, Alec and Gus. 3 Zines : Lester becomes me, lonely bearded men, Library for broken men / Lester B. Morrison. Bedknobs and Broomsticks / by Trent Parke. Saint Paul, Minn. : Little Brown Mushroom, 2010. Man with buoy and other tales / by Seth Lower. Saint Paul, Minn. : Little Brown Mushroom, 2011. Bunny Boy goes to Rome / by the Soth family ; [Gus Soth, Bunny Boy ; Carmen Soth, pictures + story ; Alec Soth, director + photography ; Rachel Soth, photos + bunny wrangling]. [Saint Paul, Minn.] : Little Brown Mushroom, 2011. Conductors of the Moving World / Brad Zellar. Lonely boy mag : No.A-1, Alec Soth’s “Midwestern Exotica” / Alec Soth. Lonely boy mag no.2 : Boys & their cars. / Alec Soth. The little brown mushroom coloring book / Jason Polan. A Head with Wings / Anouk Kruithof. House of Coates / Brad Zellar, photos by Lester B. Morrison. Saint Paul, Minn. : Little Brown Mushroom, 2012. This entry was posted in artists' books, Friends of the Library Committee, International, New Acquisitions, Unpacking the collection and tagged Alec Soth, ICP Library, Jeff Gutterman, Little Brown Mushroom, Matthew Carson. Bookmark the permalink.